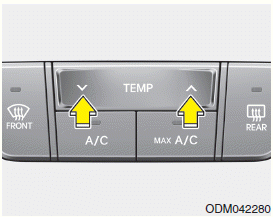 The temperature control switch allows you to control the temperature of the airflow in the vehicle. Press the (red) switch to increase temperature. Press the (blue) switch to decrease temperature. The temperature status will be displayed at the above switch panel as an indicator.